Here, the formal inspiration is derived from an ancient bronze hu, a fairly flexible form but generally consisting of a bulbous body and flared neck, although rectangular versions are also called hu. 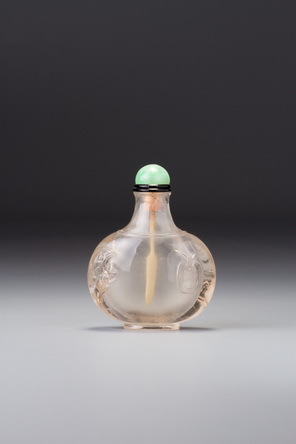 Originally a wine-storage vessel, the hu evolved throughout the bronze age of China and was carried over into the later ceramic tradition as a standard form, evolving into the elegant yuhuchun ping (‘Spring in a jade-pot vase’), the elegant porcelain form, which this bottle resembles, named after a well-known wine called, not unnaturally, ‘Spring in a jade-pot’. In this version, the original form has been amusingly manipulated so that the loop handles holding loose rings are offset on each main side instead of being shown one on each narrow side. Asymmetrical handles were not a standard feature of ancient bronzes or ceramics. This asymmetrical placing is then balanced by the detail of a low-relief bat on each main side (decoration that would never have appeared on the original bronze vessels). The bats serve to balance the offset handles but their other role is made clear by the fact that on one side the bat is not ideally placed to balance the handle, because it has been put over a prominent flaw in the slightly brown crystal in order to render an otherwise negative element in the material positive. The raised flat foot here is unusual. As a rule it would be recessed to create a common standard footrim for the snuff bottle and, indeed, for the original hu form. It functions equally well, of course, but was it an aesthetic choice or a time-saving device? 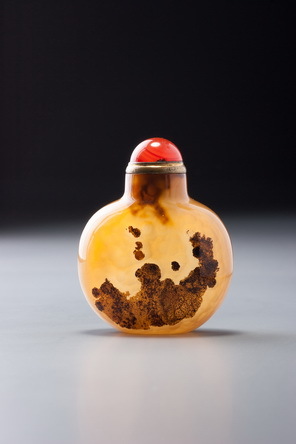 With a more painstakingly finished bottle, we could be more certain that it was the former, but here the carving marks around the details are not particularly well polished out, and the main charm of the work of art is in its rarity of form and in its symbolism rather than in impeccable technique. Another unusual feature is the combination of an oval mouth with a circular lip. Oval mouths are functionally less efficient than circular ones because the cork will only fit snugly in a maximum of two orientations and must be more carefully fitted to the specific shape. Since the neck is round and there is no need to align a stopper with an oval lip, this feature may again represent carelessness rather than choice.